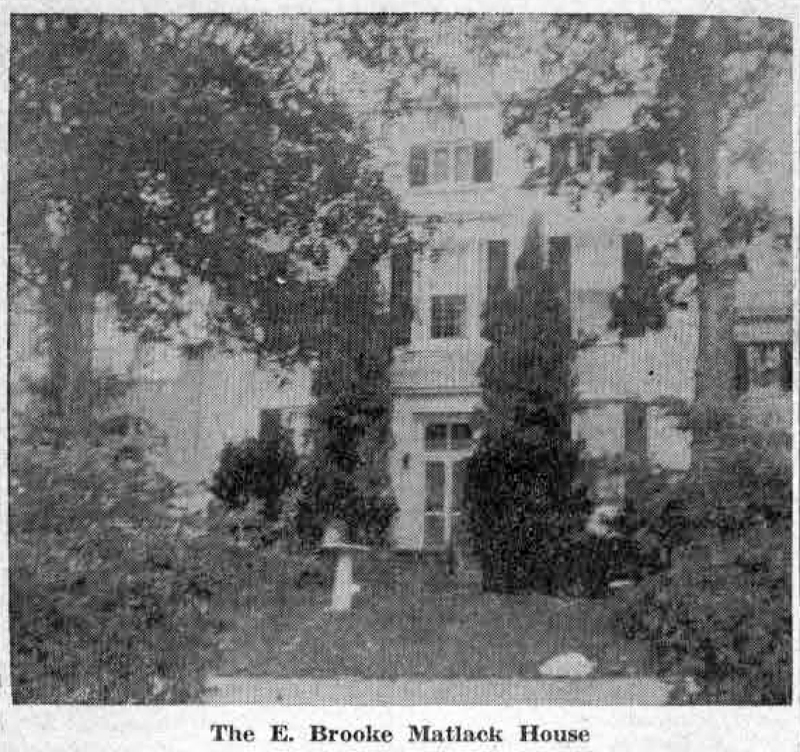 As the writer looks back to the afternoon spent at the six houses in the Radnor Historical Society tour, her thoughts dwell on the guest of honor at the E. Brooke Matlack home, Mrs. Charles E. Suffren. Mrs. Suffren was born in this lovely old home on Homestead road, Strafford, 97 years ago, on October 10, 1858. She now lives in the large white house built by her husband in 1908, to the east of the Matlack house. As guests of the afternoon gathered around her, Mrs. Suffren told of a quiet, but happy childhood on her father’s farm, when the “seasons were her calendar.” There was strawberry time, raspberry time, peach, apple and chestnut time. Chestnut time she remembers especially, since it was then that “the children had to get up early to beat the turkeys.” For once started on their rounds, these lordly birds described a complete circle of the chestnut trees that brought them back to the barn at sundown. This farm was part of a tract of 130 acres bought in 1857 by Mrs. Suffren’s parents, Mr. and Mrs. John Langdon Wentworth, for $10,000. This sum included not only the land, but two other houses in addition to the large one now occupied by the Matlacks. One of them was a small farmhouse on Conestoga road near the overpass, while the other was located on a 30-acre tract near the intersection of Gulph and Homestead roads. A year after the family’s acquisition of this new property, their small daughter, Martha, was born. As she grew up she had no playmates in her family as “one sister was too old, the other too young, and the brother went off with the boys.” In winter she attended a school run by two well-known women of their time, Miss Anna Markley and Miss Anna Matlack. The school moved its location from time to time, which “made it exciting,” according to Mrs. Suffren. Later she attended school in Portsmouth, N.H.. where she lived in a Government House with an aunt, Miss Mary Frances Wentworth. With plenty of water between. But nevor contented was she. Of three pence a pound upon tea. When the Pennsylvania Railroad abandoned Old Eagle Station and built a new one, its officials asked the Wentworth family’s permission to use the name of Strafford for it, since their nearby large estate was called “Strafford Hall” in honor of one Thomas Wentworth, Earl of Strafford. Although Mr. Wentworth was at first reluctant to agree, he finally gave his consent when the officials of the railroad explained that they needed names of two syllables for conductors to call out when they came to stations. On June 3, 1880, Martha Wentworth married Charles Suffren, a real estate lawyer of Rockland County, N.Y., where his father was a judge. The ceremony took place in old St. David’s Church with the Rev. Halsey and the Rev. Martin performing the ceremony, as they had done for the bride’s father and mother. After a honeymoon trip by train to the Delaware Water Gap, the young couple made their home in Rockland County, N.Y., where Mr. Suffren continued his practice of law for a time before going to New York City. The house, described as “the finest surviving example of Victorian mansard mansions erected in the 1870’s by James Henry Askin,” was so briefly described in last week’s column that the writer thought it would be of interest to readers to amplify that description in the current column. Although torrential rains on Saturday morning undoubtedly lessened the numbers usually attending the annual “open house” tour of the Radnor Historical Society, there were still a goodly group of visitors at each of the six houses opened for the occasion. Perhaps none was more popular than the George H. Borst house on Bloomingdale avenue, not only because of its central location, but also because of the fact that this is the first year in which a house of the strictly Victorian style of architecture has been listed for visiting. It is a style of architecture well known locally since James Henry Askin, the community’s first builder of suburban homes, was responsible for the large number of these houses built on both sides or Bloomingdale avenue between West Wayne avenue and Lancaster pike. Many of these mansard roof houses which were sold by Drexel and Childs, have been described and illustrated in recent issues of this column. A map made in 1908, still in the Borst house, shows that the owner was then Mrs. H.M. Rhoades. Before it was bought in the middle 1930’s by Mr. and Mrs. Irving F. Wolfgram, the house had been for many years the home of Mr. and Mrs. Marshall F. Smith, who were among Wayne’s best known residents of that time. A letter received from Mrs. Frederick A. deCanizares, a former Wayne resident now of Portland. Ore., identifies the house as a former home of her parents, Mr. and Mrs. Richards Johnson. The property then extended to West Wayne avenue on the south and included the lot directly back of it to the east. “All the old trees that are left on the property were planted by my mother, some 73 years ago,” Mrs. de Canizares writes. Among beautiful authentic pieces in the music room which retains its 18th Century atmosphere are a pier glass mirror covering one wall of the room, two large Victorian chandeliers, a Sheraton and a Chippendale sofa, a Chippendale piecrust table, a Victorian fireside stool and a prie-dieu. This stable, built in the 1870’s, originally had stalls for four horses. Situated at the rear of the George H. Borst house on Bloomingdale avenue, it has now been remodelled into large “party room,” the main feature of which is a walk-in fireplace of the early American type. Among the other old pieces in this room in addition to a handsome grand piano is a double stand for violin music to be used by two musicians. This beautiful mahogany piece was the property of Mr. Borst’s father, a professor and composer of music as well as an organist, who came to America from England in the middle 80’s. Interesting decorations in this room include a pair of dark blue Sevres vases and a very old Waterford candelabra. The original hallway in this house has been made into one with the now spacious living room with its many windows extending almost to the floor and its fireplace centered in the south wall. Among the many handsome pieces of old furniture in this room are a Chippendale chest-on-chest, and six Victorian chairs which were part of Mrs. Borst’s grandparents’ first parlor furniture. It is from this room that the visitor glimpses the old stable at the back of the lot which is now remodelled into a large “party room” in which the main feature is a “walk-in” fireplace of the early American type. Originally the stable had a double stall and two single stalls. Of late years the building has served several purposes, besides that of party-giving. Among other things it had been the meeting place for the Radnor Township Council of Republlcan Women. 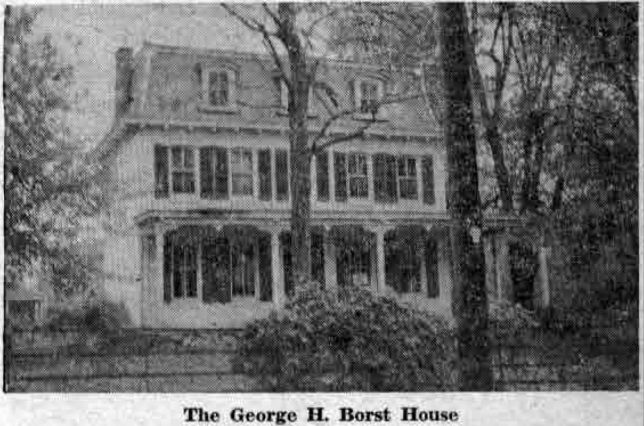 Last week’s column described two of the old houses to be visited in tomorrow’s pilgrimage of the Radnor Historical Society, details of which are given in the news columns of today’s, “Suburban.” This column continues with pictures of the other four houses. This house on Homestead road, Strafford, now occupied by Mr. and Mrs. E. Brooke Matlack, was built in 1856 by the then well-known White family of Philadelphia. A year later it was purchased by Mr. and Mrs. John Langdon Wentworth, who named it “Strafford.” Later the Pennsylvania Railroad gave the name to the station, which had formerly been called “Eagle,” as was the entire settlement that once centered around the Spread Eagle Inn and the Old Eagle School. Saturday’s visitors will have the pleasure of meeting as special guest of honor Mrs. Suffren, the former Martha Wentworth, born in this house 97 years ago, who still lives on Homestead road. This house, at 125 Bloomingdale avenue, was built in the 1870’s as part of Wayne’s earliest residential development. Because of its interest as a perfect example of true Victorian architecture, it has been selected for tomorrow’s tour of historic homes. Although the rear of the house has had various additions and alterations, the front remains as it was when it was built. Mrs. Borst has endeavored to retain the Victorian feeling by keeping the furnishings of her music room strictly in that period, and the rest of the house in the 18th century era. Saturday’s visitors will see a rare collection of antique furniture, exquisite china, glass, pewter and silver. The headquarters of the Radnor Historical Society is housed in the Colonial kitchen, with its old Dutch oven, of the home of Miss E. Dorothy Finley, on Beechtree lane. Dating back to 1789, this home was originally a tenant house on the large farm of a Revolutionary veteran, “Squire” John Pugh, whose own house still stands on the corner of Lancaster pike and Farm road. Members of the Historical Society and guests are urged to examine at leisure everything that is on exhibition in the headquarters part of the Finley home. The picture shown above was taken from northwest of the house, before trees and shrubs had grown to their present size. The entrance to the headquarters is at the southeast corner of the house. 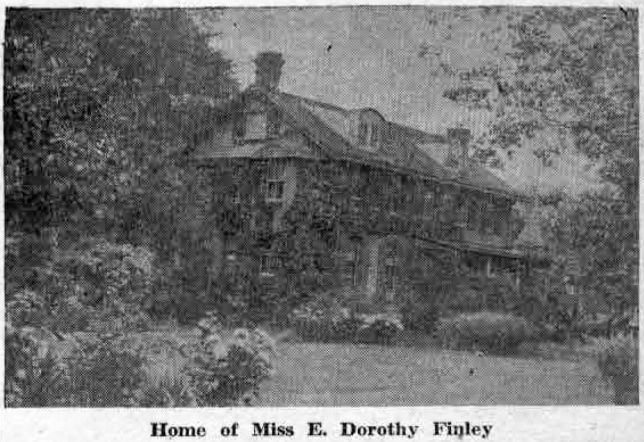 With the annual tour of historic houses scheduled for Saturday afternoon, October 15, by the Radnor Historical Society, your columnist has thought that it would be of interest to her readers to know, in advance, something of the history of these houses. Two pictures, and brief stories appear in this week’s column. Others will appear next week to cover the six houses which will be open. The original part of this spacious home was a small log cabin, dating back more than 150 years. 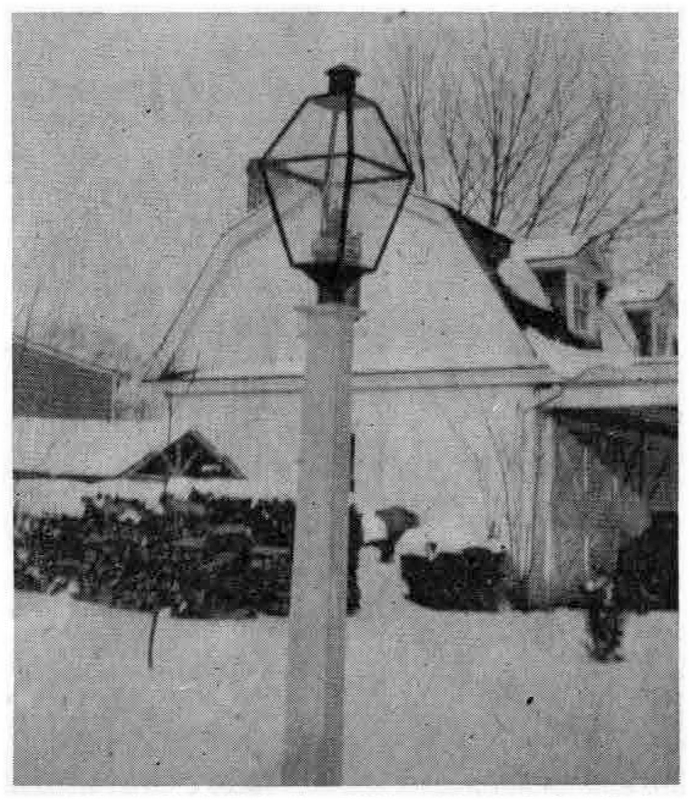 It belonged to one of the members of the large Hughes family, a name famous in the Chester Valley section because of the old saw mill, once located on the Colonial Village Swimming Club parking lot. This saw mill, with its surrounding acreage, had been in operation for many years before it was purchased in 1800 from Isaac Bewley and his wife, Anne, by William Carver and Abner Hughes. 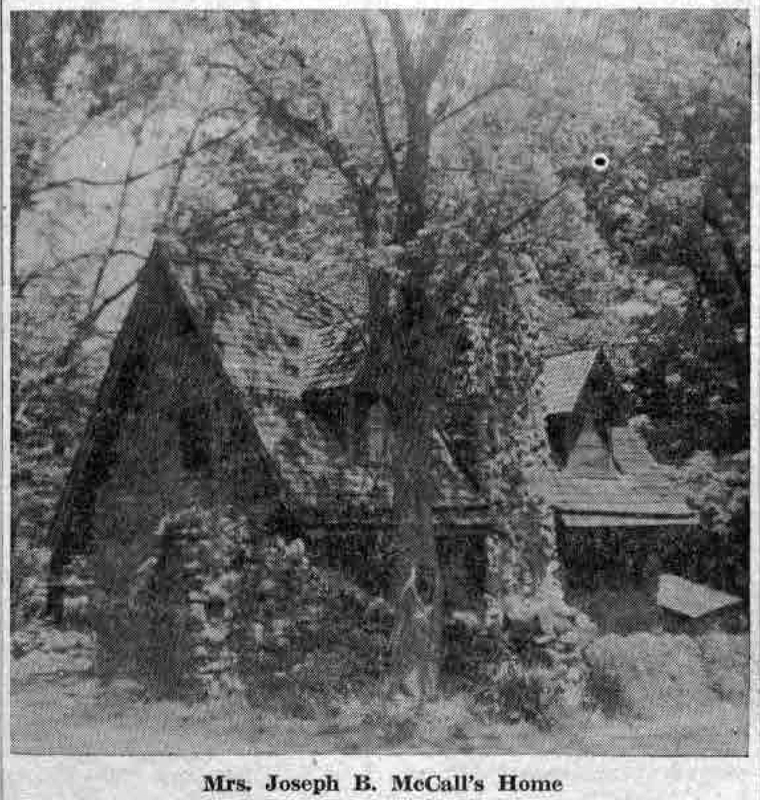 Abner Hughes’ first house was a log cabin located on the rear of the lovely old stone house on Croton road, now owned by Mrs. Dewitt P. Pugh. The stone house was Mr. Hughes’ second home, in which he died in 1844, leaving it to his son, William. 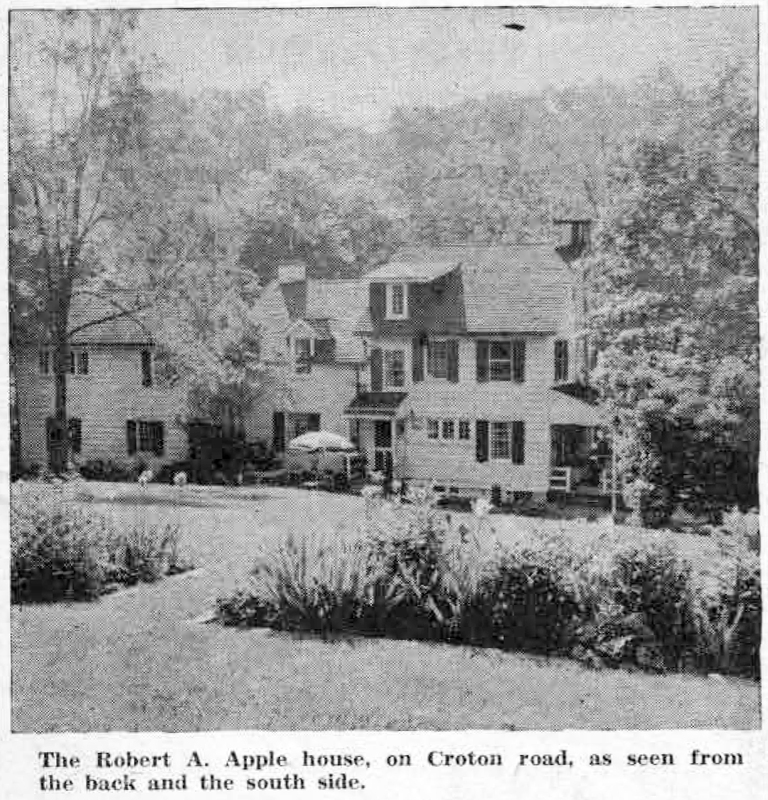 Each of his three daughters inherited a house on Croton road, formerly called Reeseville road, which leads from Reeseville (now Berwyn) to the Schuylkill River at Old Swedes’ Church. It was one of these daughters who inherited what is now the old section of the present Apple house. This house, located on Radnor Street road, is but a short distance from the Apple house on Croton road. The original part, dating back to 1648, is the oldest house in this section of which there is any record. The man who first cleared the land and built the small cabin, which was to endure for so many years, was a Welshman named Lavis. In 1702, one of his descendants, David Lavis, sold the property to John Davis, a silversmith of Philadelphia. The first Lavis must have made his way by Indian trails to the spot where he built the house for his family, from materials close at hand. This original house, with its unevenly spaced windows, its floors at different levels and some of its ceilings higher at one end of the room than at the other, now forms the center section of the present structure. All the beams in it are hand hewn. 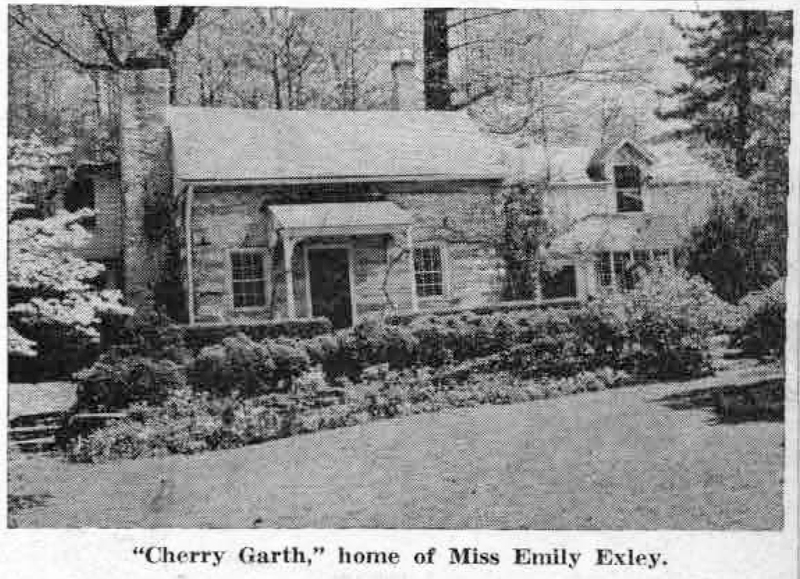 Four years after her purchase of the property, Miss Exley bought additional acreage. With wood from trees on this land and with stones from the old grist mill nearby, an addition was erected on either side of the small log cabin, to harmonize with the original primitive little structure. Now called “Cherry Garth” by its owner (“Garth” means an “enclosure”), its lovely gardens are planted almost entirely with flowers and shrubbery native to this section. Saturday, October 15 – when the Radnor Historical Society will have its annual tour of old houses in the Wayne vicinity. The showing, with hours from 1:30 to 5:30 P.M., is described at length in Emma Patterson’s “Your Town and My Town” column.